As you get more deeply into energy healing, it can be useful to develop hand sensitivity. Below are two effective exercises to help you with developing hand sensitivity so that you can sense subtle energy better. Most people's hands are highly sensitive. (Among other things, we have minor chakras in our hands.) I believe that everyone can learn to feel subtle energy with their hands. All you need is a little practice, and a willingness to suspend the cultural conditioning that tells us that the only thing that is "real" is physical matter. 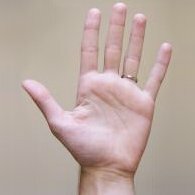 It's often easiest to start developing hand sensitivity with your own energy, but you can also adapt it for doing with a partner. Ready? OK, here we go. Sit comfortably with your back straight and tall. Allow your mind to quiet down. Spend a few minutes breathing deeply and comfortably into your belly. When your breath has become slow and even, then you are ready to go on. Rub the palms of your hands briskly together for 15-30 seconds. Hold your hands out in front of you, palms facing each other. Keeping your elbows in close to your sides will probably be most comfortable. Slowly bring your hands together, as close as you can without touching. Pay attention to any sensations you feel in your hands. Slowly bring your hands apart again, so that they are separated by 6-12 inches. Repeat this process several times, bringing your hands together and apart. Be slow and steady. As you do it, pay close attention to your palms. You may experience a sense of pressure or thickness between your palms; warmth; buzzing; tickling; rubberiness; pulsing; or other sensations. You're feeling energy! Don't worry if you feel something different that described above. Everyone is unique in what and how they sense energy. Don't worry that you are imagining what you are feeling. You aren't. Allow yourself to believe in what you are feeling. If you can't feel anything yet, don't be concerned. Try "imagining" that you are feeling something. This technique can be very useful in opening a mind that is closed to the experience. If you still don't feel anything, don't worry. Sometimes it takes a while. If the experience is new for you, you might not know what you are feeling for. So just keep an open mind and keep working on developing hand sensitivity by repeating this exercise at later times. If you are feeling something, try to articulate what it is you are feeling. It's exhilarating to feel subtle energy the first time! The door to a whole new world has opened to you. Congratulations! Now that you've felt energy, take it to the next step. If this is a new session, start by sitting comfortably and breathing deeply until you are relaxed. Rub your hands together briskly for 15-30 seconds. Roll up your shirt-sleeve to bare the forearm of your non-dominant hand. Hold your dominant hand palm-down over your bare arm, a foot or two above it. Slowly bring your sensing hand toward your arm, paying close attention to what you are feeling. At some point, you will likely begin to feel sensations in your sensing hand, as described in Step 6 above, although perhaps not as strong. How close do you come to your arm before your sensing hand starts to feel the energy? Can you articulate what you are feeling? Repeat this exercise several times. As discussed in Exercise One, don't be concerned if you have trouble sensing the energy at first. Just keep an open mind and keep practicing, and you will. What people feel when they are sensing subtle energy is highly individual. When I first started learning energy healing, mostly I could only feel a buzzing in my hands, or warmth. But as time went on and I gained more experience, my hands became more sensitive. I can't always describe in words what it is I'm feeling, but the feelings are usually very definite. I want to stress that everyone interprets through different "filters," so everyone probably has different experiences. To me, a person's energy might feel smooth, rough, full, empty, warm, cool, prickly, rubbery, buzzy, electric, painful, congested, fine, dense, imbued with light or color (although this is visual, I pick it up through feeling), dark, cloudy, pulsing, pulling, pushing, or a host of other things. Sometimes I feel imbalances in a person's energy. Some chakras may give me lots of "information," and others little at all. Sometimes I feel "releases" from the chakras or other areas of the field, like little puffs or even bumps against my palms. Sometimes as I work with a person's energy, I feel the quality of the energy change in intensity or quality, often increasing in what I might call smoothness, richness, dimension, or integration. And as I said, there are many things that I can't even describe in words. But these are my sensations and my words. What you feel and how you describe it could be very different! If you don't feel or sense anything, don't worry. Allow yourself to imagine that you are feeling something! This is a good way to unblock your perceptive abilities. Also, know that if you think you feel something, you almost certainly are. Just trust that it's real, and know that with practice your sensitivity will grow. While it is useful and personally rewarding for a healer to be able to sense energy, it is not absolutely necessary. It's enough to hold the intention to heal. And anyway, there are other ways to get a sense of what's going on with your energy. 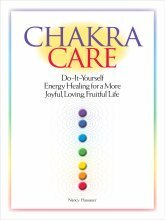 You might enjoy "Chakra Care: Do-It-Yourself Energy Healing for a More Joyful, Loving, Fruitful Life," the book that I wrote to help people realize that they don't need to be an experienced energy healer to influence their own energy, or to get a sense of what's going on with their energy. You can tell a lot about your energy just by looking at your life, because your energy is going to be reflected there. Chakra Care specifically looks at each of the chakras and how you can tell if they are thriving, or if they could use support and healing. Plus lots more. You can go to this page for a discussion of whether it's necessary to know what particular sensations means. Return from Developing Hand Sensitivity to Sensing Subtle Energy main page. Go from Developing Hand Sensitivity to site home page.